My institution includes a two-semester writing sequence as part of its general education requirements. Writing II is a 200-level class intended to be taken in the second year of a student’s college experience but in truth students range from first-year students who fulfilled their Writing I requirement during high school to seniors who have either put off taking the class or are taking it again to improve their grade. This is not a popular class among instructors or students and has gone through many transformations during my decade in this program. Just prior to my first semester teaching it, the class was un-paired from a content-area class offered in another department. The new evolution (replacing the paired classes) involved offered topic-related classes such as humanities, science, and practical living taught in the English Department. For several years I taught a version of this class that was labeled “writing in the sciences” and used readers focused on place and/or the environment to inspire our classroom discussion and writing. The most recent evolution of this class has required a common reader and common assessments. During this same time period I became increasingly interested in the writing-about-writing pedagogy movement inspired by Doug Downs and Elizabeth Wardle (read more about it on my blog) which argues that the topic of writing classes should be writing. I had already taught a Writing I class using that approach and wanted to continue with this work in Writing II. While the focus of my Writing I class was on the writing required by college in general and the students’ majors in specific, I decided to make the focus of my Writing II class about writing in the students’ intended field and profession. I am happy with the focus of this class although I have struggled with some of its individual components. The Fall 2011 Semester is my third successive semester teaching this class. This is in part because it is unpopular with my colleagues and in part because I consider my implementation a work-in-progress and I am still trying to get it right. Each semester I have made adjustments to the class but it is still not right. In particular, I have struggled with implementing the class reading assignment (you can read more about my struggles with this assignment on my blog). Over the years, I have taught this class in a variety of formats including the more traditional face-to-face meetings during the day on campus, night classes at a regional campus, and online during the regular semester and during the summer. I was inspired by my non-traditional off-campus students to pitch, design, and pilot the online version of this class and have taught it almost every semester since its original implementation online. 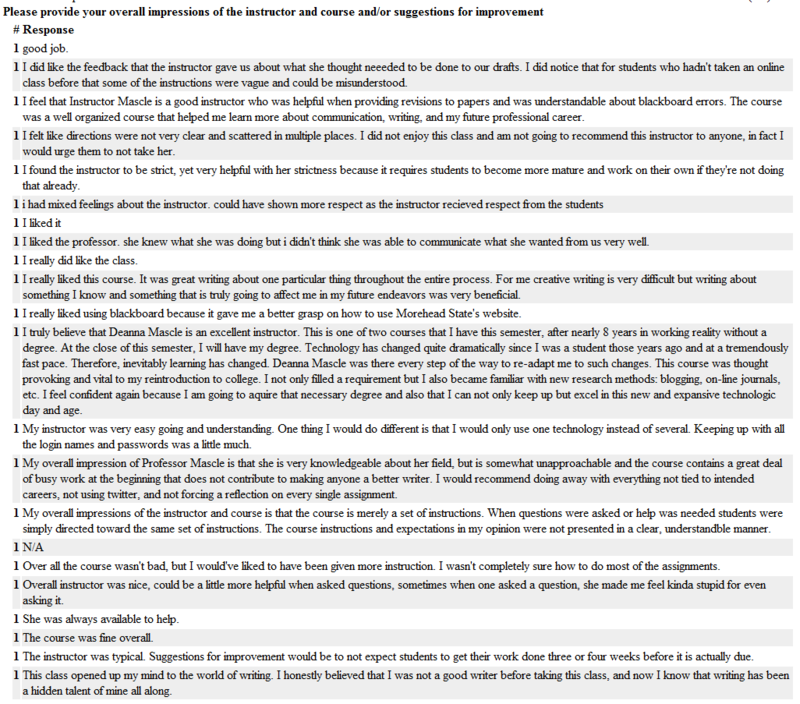 The syllabi and student feedback below only apply to the semesters I have taught the writing-about-writing version online. You Can Lead A Student To Her Journal But You Can’t Make Her Reflect — Or Can You?